Former River Café chef Theo Hill will open his first solo venture called Gold in London’s Notting Hill this spring, offering a modern European menu with an Italian focus. Led by Theo Hill, the chef will be joined by Alex Ghalleb and Arez Akgundogdu, formerly of the Soho House group. 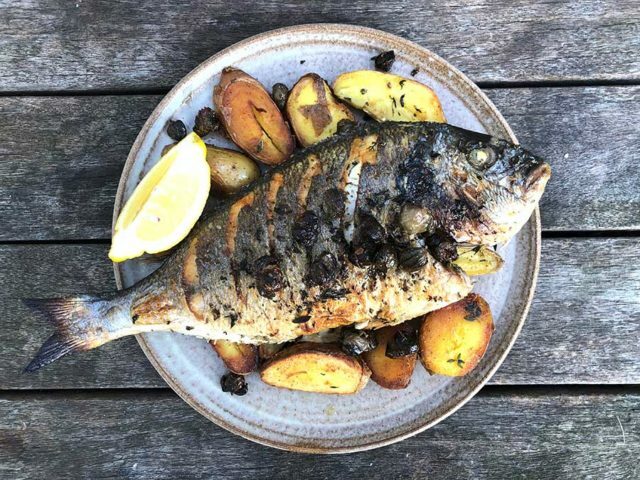 The new neighbourhood restaurant and bar will open on the site formerly occupied by the pub Portobello Gold on Portobello Road in west London’s Notting Hill. The menu promises to feature plates designed to share that “exude colour, taste, and modern freshness, with a focus on produce-led, minimal process cooking,” including a whole sea bream with wild oregano and capers; burrata garnished with charred pears, Parma ham, radicchio, and balsamic vinegar; wood-roasted cauliflower with toasted buckwheat, cumin, yoghurt, and coriander; and nettle ravioli consisting of sheep’s ricotta and sorrel. The four-floor space will include a bar, open kitchen and garden room featuring trees and a retractable roof, with further dining areas and a private dining room on the upper floors. The “Modern bohemian interiors, from local architect and design duo Felix and Valerie von Bechtolsheim, will draw on Portobello’s once-thriving industrial past to create a restaurant and bar that is both informal and open” inspired by the artists, designers and musicians of Notting Hill. Portuguese artist Vhils has been commissioned to create a series of works, one of which will cover the exterior of the restaurant.